AZ Polo Party First. Only 2 Weeks Away. Join Us. Rare is the opportunity to see the best players in the world, in any sport. But that’s what will happen January 14th – 15th when the world’s best arena polo players come to Scottsdale for the first time. Taking place within the planet’s most amazing car auction – Barrett-Jackson – Tommy Biddle, Jr. will lead the USA squad versus the team from England led by Chris Hyde for The Townsend Cup. Both are ten-goalers, the highest rating in the sport. Arena polo is more physical and has more scoring than the pageantry and play on display at The Bentley Scottsdale Polo Championships. It’s a different kind of horsepower within a collector car auction that defines the very essence of automotive horsepower. It’s a combination and Arizona-first you don’t want to miss. Join the United State Polo Association, Barrett-Jackson and The Bentley Scottsdale Polo Championships for this unique event January 14th – 15th at WestWorld of Scottsdale. What could be better than strolling the incredible grounds and cars at Barrett-Jackson and then watching the world’s best face-off in arena polo? 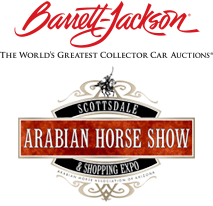 Any General Admission to Barrett-Jackson provides entry to The Townsend Cup and other arena polo matches. Reserved VIP tickets in the first two rows and mid-arena seating are available for an additional $30. Both can be purchased here. For more information please go to ThePoloParty.com/Arena/ or call 480.423.1414.